It's finally spring, and while that means warmer weather and May flowers, it also means thunderstorms, poor band conditions and less activity on the radio, at least in my case. Last weekend was a beautiful weekend, so a couple of quick contacts early Saturday morning was the end of my activity. I did buy another radio during the last two weeks. Ever since the Dayton Hamvention last year -- the world's largest gathering of hams -- I've been thinking about ordering an Elecraft K3. I've held off, thinking that I'd wait until the new radio was in full production and there wasn't a six-month wait. Saturday morning is probably my most consistent time to get on the air. I usually get up early, the wife is still in bed, and I head for the basement to play with the radios for a a couple hours. For some reason, the dogs have gotten in this habit, and wait for me by the basement stairs on Saturday and Sunday morning and are upset if I'm not heading downstairs by 7 or so. Here's a quick wrap-up of this weekend's contacts -- all on 40 meters and CW. K4UY, Ron in Madison, AL. This was our third contact in the last year. We talked about where he lives, the Huntsville area, and how nice it is. I travel a lot for work, so often know the area where my contacts live. People like to talk about where they live, so that's often good fodder for conversation. NS9F, Gene, Lockport, IL. This is maybe 10 mile from my house. I've run into this gentleman a couple times on 40 meters, we had a nice chat. When I'm not in the basement playing with my radios, I work as a editorial director of a small publishing company, producing a variety of trade magazines and web sites in the woodworking and agribusiness markets. You can view a couple of those at Countertop Business and EcoAgri.Biz. I grew up in a small town in west Nebraska, and got my first ham license at the age of 12. My call was WN0NHG. I got my General license a year later, and was assigned the call WA0QMZ. Back in those days, your only choice of a call was the random call assigned by the FCC. When I got active in ham radio again in the late 90s, I discovered the FCC had instituted a vanity call sign program, so I chose my current call, K9OZ. The 9 is for the 9th call district, which inlcudes Inidiana, Illinois and Wisconsin. Nebraska is in the tenth call district, hence the calls with the 0 in them. 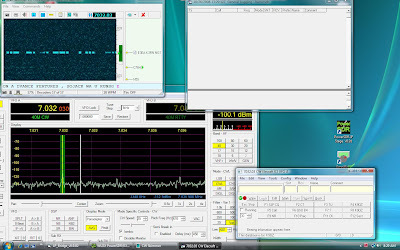 CW is sending Morse code, yes those dits and dashes you learned in Boy Scouts, over the radio in a continuous wave mode, hence the abbreviation CW. It used to be widely used in maritime, military and railroad communications. It's a highly efficent, highly effective way to communicate. You can communicate farther, with less power and a more simple radio, than in most other modes. A lot of the arcane phrases and abbreviations in Ham radio stem from its roots in telegraphy. Long before kids were texting short messages, telegraphers were figuring out abbreviations. Some of these are being picked up by the texters today, some not. An unmarried woman is a YL, short for Young Lady. When she gets married, she becomes an XYL, ex-young lady. My wife doesn't like that phrase, she still thinks of herself as a YL. My XYL -- that's hamspeak for wife or X young lady -- pointed out that I've failed to mention that she's also a ham. A few years ago she decided she wanted to be able to use the radio in the car, and got her license. She later upgraded to a General class license, and even passed the code test back when that was a requirement. Her call is K9GAL. I've managed to get her on HF a few times, but she spends most of her ham time on the local repeater. We took this picture a couple years ago in front of the vintage equipment I had at the time. Most of the gear in the background has moved on to other owners. One of my favorite new toys is a Patcomm 16000A, the top radio in this photo. I found it on E-bay last month at a nice price, and jumped on it. It is a nice cw rig, with nice filtering and a built-in keyboard. Patcomm went out of business shortly after introducing this radio, so it's one you never hear on the air. I tell people what I'm running and the general answer is "I never heard of it." Yet its a dandy little CW rig. I consider myself a casual contester. Sometimes I wonder why, but yesterday was a good example why. 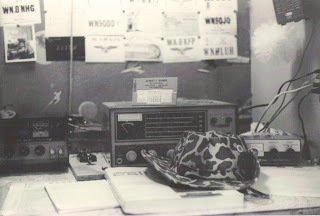 Saturday morning is often my time to spend a couple hours in the shack playing with the radios. I'd had a couple nice cw QSOs and listened to part of an AM net, but tuning around I heard CQ 7QP. A quick check of the contest calendar at the ARRL web site and I discovered the 7th call district QSO party was on. Bascially, its a combined state QSO party of all the states in the 7th call district. I was hearing Wyoming, Montana, Washington, Arizona, Nevada, Oregon and Idaho on 40 meters, so I set up my logging program for it and dove in. Tonight I worked WB3AAI/QRP. He was running an Elecraft K1 at 5 watt into a St. Louis Vertical, made from wire and a fiberglass fishing pole. Lou was on a mountaintop in the Allegheny mountains of Pennsylvania, and was a nice contact. It's amazing what can be done with a very small radio and a very simple antenna, even on a night like tonight where the atmospheric noise and static was very high. I need to get back on QRP more this summer. QRP is low power, less than 5 watts, by the way. Most large modern radios are rated at 100 watts. I run most of mine at 50 watts for day-to-day operation. Tonight there are multiple lines of storms moving through the area, so not a good radio night. That makes it a good time to update the blog. I promised to talk about radios a little. In the last 10 years I've been active in radio again, I've found myself buying and selling a lot of radios.